American advertising has long been a laughable farce. Marketers are engaged in a dubious trend of selling ugliness to us. Why? Maybe it is working? To what lengths will a company risk debasing themselves and undermining modern advertising? What do the trends in advertising truly have to say about us, our culture, and our values? If you turn on CNN, you might get to see some news. They demand that you are privileged to see the most enticing stories you'll find anywhere, and that includes giving you signals of what emotions to express when they say certain things, leaping at their cues like a trained animal. They are not good at providing information that makes you feel good about the world either. Emotion words like horrific and devastating are okay to use in objective news, but splendid and lovely are not. Let's take a quick snapshot at the Weather Channel web site. If you've ever visited it, you already know you'll get a face full of sensationalist content about a giant avalanche, diseases you don't know you already have, or snakes that can eat a whole car. Okay, I made that last one up, but I'm sure I had you going for a second there. Let us determine the organizational structure of the advertisement material, shall we? 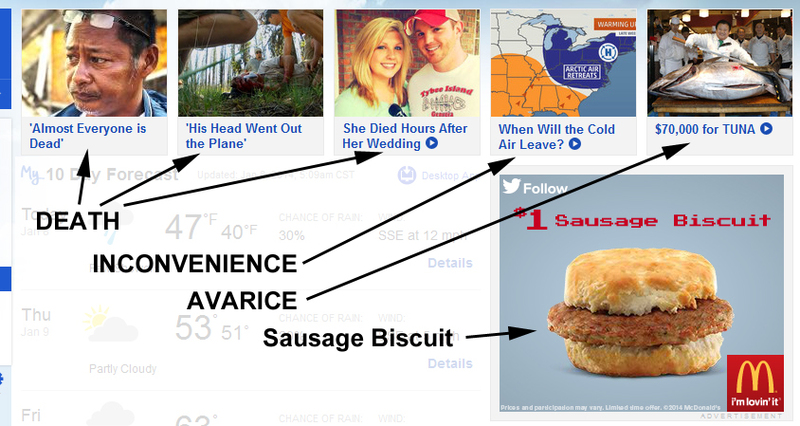 As you can see for the above, presented as if it were part of their native content, promoted content comes in four categories: death, inconvenience, avarice, and sausage biscuit. Death content is to trigger your fight or flight, to make you click it to find out if not clicking it would have killed you. Inconvenience content is to trigger your demand for comfort, to make you click it to "make the blizzard go away", or so that you can exclaim "I totally get you, my man!" while bumping chests with a web site who understands your needs. Avarice content is there to make you stand up against inequality, to make you click it to make people in favorable circumstances slip in a mud puddle instantly. It really happens. Finally, if there's no earthly way you're dead, dying, diseased, burdened, greedy, conniving, obsessed with celebrities, or afraid of bees or hula-hoops, maybe you'd like a sausage biscuit? Through no fault of their own perhaps, that site has affiliates who feed on train-wreck syndrome -- that is, your inability to look away from something revolting or threatening or made of sausage. Ultimately, it reflects poorly on them, but remember, it was your choice to go there. Maybe that'll teach you to wonder what the weather is. Posted in Thoughts on 2015-06-19 06:18:00.